Havana, Cuba, Mar 7.- Without risking too much, Cuban IM Carlos Albornoz signed peace with local GM Noel Studer during the eighth and penultimate round of the Accentus Young Masters 2019 chess tournament, which takes place in Bad Ragaz, Switzerland. Havana, Cuba, Mar 6.-Cuban IM Carlos Albonoz was handed his first loss in the Accentus Young Masters 2019 chess tournament running in Bad Ragaz, Switzerland, where local GM Noel Studer remains as solo leader after seven rounds. Camagüey, Nov 8. -The final of Chess Municipal Students Tournament, in the category 9-10 years of age, for both sexes, will begin today in the hall José Raúl Capablanca, of this city. Camagüey, Nov 2. 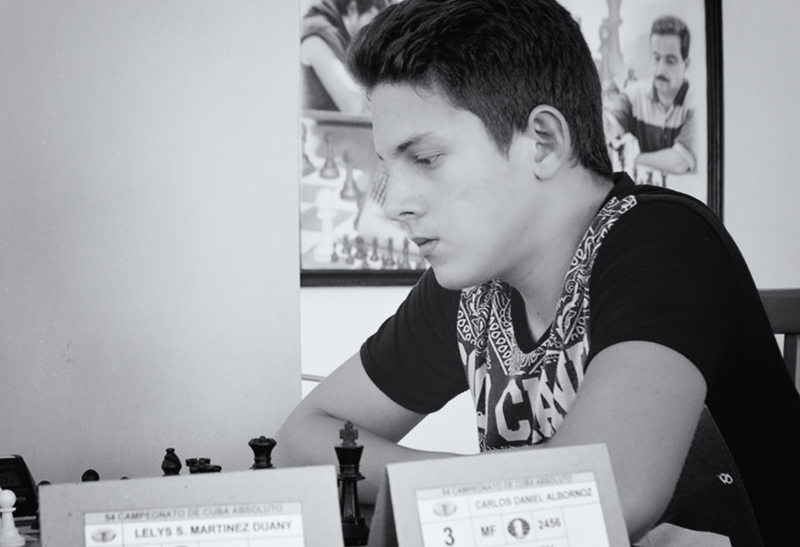 -The Young International Camagüey master Carlos Daniel Albornoz is held among the top ten of Cuban chess, after the latest update of International Federation of Game Science’s ranking. Camagüey, Oct 9. -The grand final of the Absolute Provincial Chess Tournament will begin tonight, at the academy José Raúl Capablanca of the capital city, with the participation of seven players. Havana, Oct 5. -Both Cuban squads yielded 1.5-2.5 to their respective rivals in the 11th and final round of the 43rd Chess Olympiad of Batumi, Georgia. Havana, Oct 3. -The Cuban women’s team tied 2-2 with Viet Nam in the eighth round of the 43rd Chess Olympiad taking place in Batumi, Georgia, where China and Ukraine share the top while United States leads the Open Group. Camagüey, Sep 22. -The Camagüey player Carlos Daniel Albornoz heads the participants list in the National Chess Tournament “Migoya in Memoriam”, which takes place this weekend in the capital city of the province. Camagüey, Jul 18. - The Camagüey square achieved the second out-standing place in the Chesstournament of the School National Games of High Yield, disputed in Villa Clara, and gained by the hosts.